Response: The Fang lab has a longstanding interest in the interaction between nitric oxide (NO·) and pathogenic bacteria. NO· is an important mediator of the host innate immune response that restricts the growth of invading bacterial pathogens. One of the known actions of NO· is the reversible inhibition of aerobic respiration that results from NO· binding to the heme centers of terminal oxidases. Like mammalian hosts, many bacteria also possess the ability to enzymatically synthesize NO·. Our latest research investigated the physiological role of the Staphylococcus aureus nitric oxide synthase (saNOS). We discovered that endogenously produced NO· is able to target bacterial terminal oxidases under microaerobic conditions, allowing the bacteria to transition to nitrate respiration when oxygen concentrations are limited and helping to maintain the membrane potential. 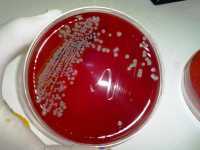 This process was found to be essential for S. aureus nasal colonization in a mouse model. Thus, a conserved mechanism is involved in both the antimicrobial actions of NO· and the physiological role of NO· in regulating bacterial electron transfer reactions. Interestingly, NO·-heme interactions have been shown to control mitochondrial respiration during hypoxia in mammalian cells.